MINNEAPOLIS--(BUSINESS WIRE)--Apr. 13, 2016-- Piper Jaffray Companies (NYSE:PJC), a leading investment bank and asset management firm, completed its 31st semi-annual Taking Stock With Teens research survey, which highlights spending trends and brand preferences amongst 6,500 U.S. teens across 46 U.S. states. Since the project began in the spring of 2001, Piper Jaffray has surveyed more than 130,000 teens and collected more than 35 million data points on teen spending in fashion, beauty and personal care, digital media, food, gaming and entertainment. “While total spending among the teen demographic appears to be down versus last year, we are encouraged that overall teen employment appears to be on the rise; 39% of teens indicate they hold a part-time job, which is up 400 basis points over last year’s levels. As they take more control over their discretionary spending, we believe it is critically important to watch for category shifts and brand preferences,” said Neely Tamminga, Piper Jaffray senior research analyst. While overall teen spending is down compared to spring 2015, the percentage of wallet spend on key fashion categories―clothing, accessories, and footwear―is up to 38% versus 36% a year ago among upper-income teens. Denim brands saw an uptick to 14% aggregated mindshare and showed up as a top trend among upper-income females for the first time since fall 2013. Among women, fashion athletic apparel is still on the rise with a new high of 17% share achieved and Nike gaining share. Within men’s apparel, Nike results were more mixed across income demographics. Adidas was a positive standout in the athletic footwear and clothing category. The beauty category’s wallet share among upper-income females reached 10%―the highest value in 10 years. Specialty store formats continue to outpace legacy channels for beauty. Restaurants represented 22% of overall spending for upper-income teens; teens overall are choosing limited-service concepts at a 50% greater rate than full-service concepts. With that, teens consider the overall value equation versus price-alone when choosing preferred dining destinations with the average range in check size from $4 to $17. Amazon Prime adoption has increased across all income brackets in each of the past five surveys with this survey indicating Amazon Prime exists in 51% of households of the teens in our survey. This survey, along with other previous Piper Jaffray consumer surveys, suggests that there are 57-61 million Prime households in the U.S. 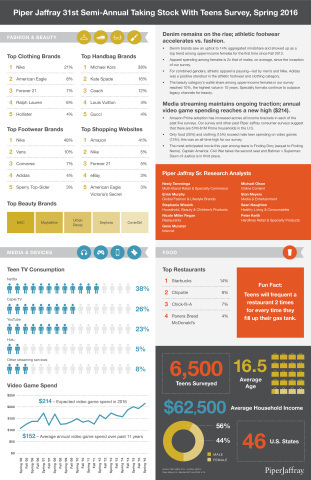 The only two categories that exceed male teen spending on video games (13%) are food (20%) and clothing (15%). Video game spending among males is at an all-time high for our survey. Teens are spending more time on Netflix and YouTube as opposed to traditional TV. The amount of time they spend on these websites combined equates to 66% versus traditional TV at 26%. The most anticipated movies this year among teens are: 1) Finding Dory (sequel to Finding Nemo); 2) Captain America: Civil War takes the second seat; and 3) Batman v Superman: Dawn of Justice. For an infographic and more information regarding the fall survey, please visit www.piperjaffray.com/teens. The Taking Stock With Teens survey is a semi-annual research project comprised of gathering input from approximately 6,500 teens with an average age of 16.5 years. Teen spending patterns, fashion trends, and brand and media preferences were assessed through surveying a geographically diverse subset of high schools across the United States.